Despite the increasing popularity of adventure travel, results of a just-released survey shows that nearly twice as many people prefer relaxing get-aways to active vacations. In a 17-country online survey conducted by market research company GfK, 59 percent of respondents said they preferred a vacation "where I relax and take it easy." That compares to just 35 percent who preferred "an active vacation where I do or see lots of things." Only six percent were unsure or expressed no preference. Internationally, there is virtually no difference between men and women in those preferences. Sixty percent of men preferred a relaxing vacation compared to 58 percent of women. When it comes to active vacations, men and women stood neck and neck at 35 percent each. Families with teenagers were slightly more inclined to prefer being active. Among households with children ranging from less than six to twelve years old, 62 percent favored relaxing vacations while families with teens preferred relaxing vacations 57 percent of the time. Predictably, younger people expressed a greater preference for active travel while the older the age group, the more inclined they were to take things easy, though there was an interesting exception. Teenagers were the most inclined to favor active vacations, with 43 percent selecting that form of travel as their preference. The inclination toward active vacations then dropped steadily with each age band, ending with those aged in their fifties, and those aged 60 or over, both standing at 33 percent favoring active holidays. However, the age group with the highest percentage saying they prefer relaxing holidays was not the oldest two age groups; it was those aged in their 40s, where 64 percent said they wanted to take it easy. By comparison, 57 percent of those aged 60 or over said they favored relaxing vacations. That departure may be due to the demands everyday life places on people in that age bracket: the demands of their careers and perhaps children in college make unstructured down time all the more appealing. While the breakdown generally follows a logical progression when it comes to age, nationality is another matter. Nearly half of Italians and French preferred active holidays, while over two thirds of Brazilians and South Koreans wanted to relax. Italians, French and Spaniards led in having the highest percentage of their population who prefer active vacations, at 45, 44 and 43 percent, respectively. 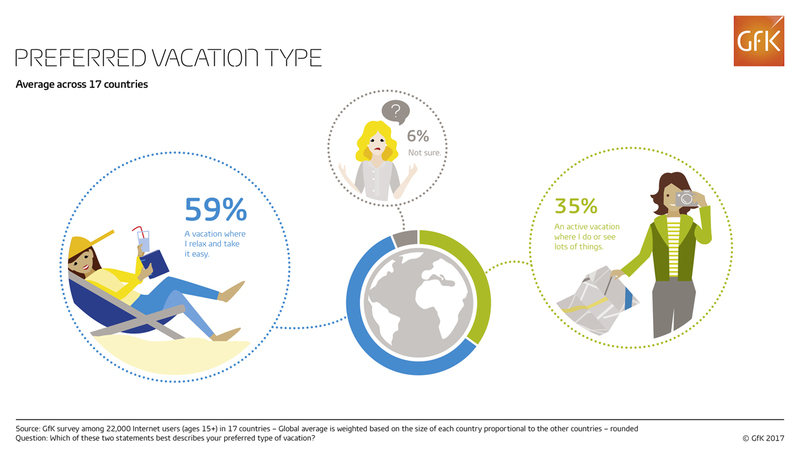 By contrast, Brazil, South Korea and Japan led for having the highest percentages preferring a relaxing vacation, at 71, 66 and 66 percent, respectively. While interesting in general, the data has a great deal of value for the travel industry, giving purveyors a better understanding of what is being booked and by whom, and helping them fine-tune their offerings to better meet the demands of their customers.